Letteratura giapponese e letteratura irlandese: cos’hanno in comune? Nulla, si direbbe a prima vista, a parte il fatto di essere due grandi sconosciute in Italia, di cui si ricordano solitamente una manciata di autori celebri: da un lato, Wilde, Joyce, con l’aggiunta di Beckett e Shaw per gli amanti del teatro; dall’altro, Mishima, Murakami e Banana Yoshimoto. Eppure, esse si sono incontrate nella produzione di alcuni grandi poeti, quali il premio Nobel Seamus Heaney. 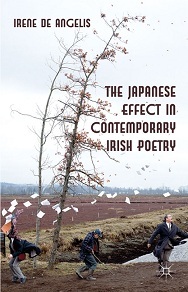 The Japanese Effect in Contemporary Irish Poetry provides a stimulating, original and lively analysis of the Irish-Japanese literary connection from the early 1960s to 2006. While for some this may partly remain Oscar Wilde’s ‘mode of style’, this book will show that there is more of Japan in the work of contemporary Irish poets than ‘a tinkling of china/ and tea into china.’ Drawing on unpublished new sources, Irene De Angelis includes poets from a broad range of cultural backgrounds with richly varied styles: Seamus Heaney, Derek Mahon, Ciaran Carson and Paul Muldoon, together with younger poets such as Sinéad Morrissey and Joseph Woods. Including close readings of selected poems, this is an indispensable companion for all those interested in the broader historical and cultural research on the effect of oriental literature in modernist and postmodernist Irish poetry.